My sewing skills are slim to none. If a button falls off a shirt or there's a hole in something I'm not too shabby at fixing them, but other than that any '50s housewife would shake their head at me. I only use those cute little ball-topped sewing pins for decor purposes such as the fabric looms shown in my DIY Hoop Wall Art post. The more I used these pins on my wall the more I wanted to keep them easily accessible and decorative on their own in a pincushion. 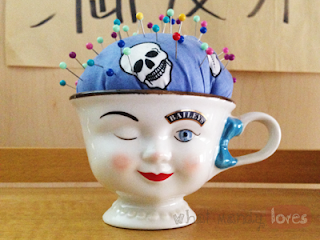 Purchasing a pincushion feels like I'm lying to myself (sucking at sewing and owning professional supplies? LIES), so Pinterest saved the day with a bunch of DIY pincushions! This particular tea cup one is my favorite (and there's too many versions to link to a source). This Bailey's tea cup was my mom's purchased in San Francisco in the '80s. I've always used it for decoration since using it for beverages seems wrong (and drinking from things that have faces on them, a little creepy). 1. Stuff a handful of cotton into your bandana or piece of fabric at the center and twist it into a ball. 2. Secure the ball at the ends with an elastic band. 3. Place the ball end-first into the tea cup. Reshape the ball if needed so it sits inside the cup nicely. You may want line the inside of the cup with glue if your unsure it will stay down, but I left it as is due to me hating permanent projects (I want the option to re-purpose later if I change my mind like I always do). 4. Stick your pins into your new pincushion! 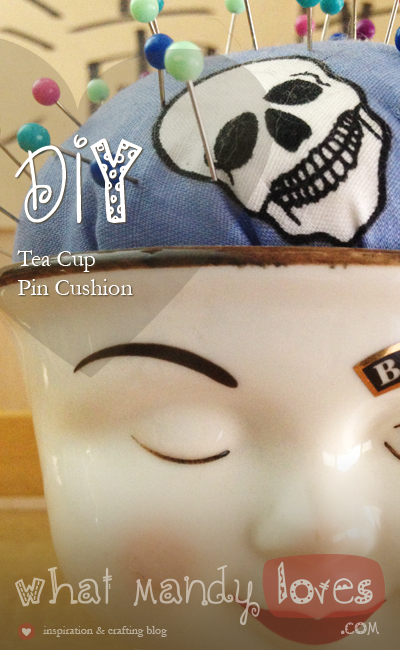 What are some other pincushion DIY's? What kind of cups and fabrics would you use for this type of project? Let me know in the comments!